We select what the most important examples of Helsinki Architecture. 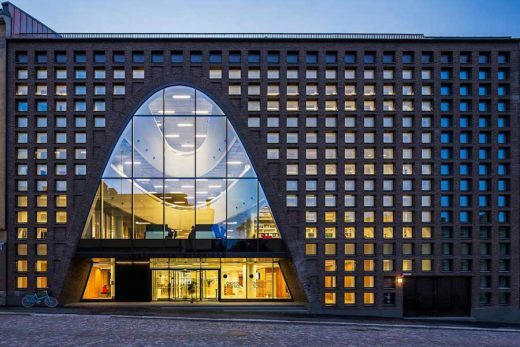 Our focus is on contemporary Finnish buildings. This building is located on the south side of the Narinkka square in central Helsinki. It is one of Finland’s most lively urban spaces. With its curved wood facade, the small sacral building flows into the city scape. Simultaneously the chapels gently shaped interior space embraces visitors and shields them from the bustling city life outside. Helsinki University Main Library is the largest academic library in Finland. The building is located in a historically important city centre block. The new building uses a curved brick facade, integrated within the street line formed by the adjacent buildings. Design proposal ‘BIBLIO-Centrum’ is intended to be a center of diverse cultural and intellectual activities, a congregating point for people with a thirst for knowledge. Shared Dreams is a proposal for the new Helsinki Library, sited at a strategic point within the city, the cultural cluster in the Töölönlahti area, with the Helsinki Music Centre, the Aalto congress centre, and the Kiasma contemporary art museum. Office buildings and housing also contribute to urban life around the Makasiinipuisto Park. The new library is committed to strengthening this cluster. This dedicated cemetery chapel aims to reconcile the emotional needs of mourners with the pragmatic demands of funerals. The building uses similar materials to the old structures in the area and the roof is patinated copper, like the roof of the old church. Many of the ceilings are finished with removable, perforated copper trays. The glazed walls toward the graveyard in the chapels are covered with a patinated copper mesh, which functions as a screen between the outside and the internal spaces of the chapel.